Tokyo Milk is a small company with a delightfully inventive (and surprisingly affordable) line of fragrances called "Parfumarie Curiosite" [sic], as well as complementary perfumed soaps. Although I enjoyed reading the descriptions of all the scents in the line, the floral-lover in me was most drawn to Waltz Parfum 14 (formulation not specified, but probably an Eau de Parfum, shown above left) and Waltz Perfumed Soap (scented, somewhat confusingly, with a fragrance blend called "Minuet 14", shown above right). Photos don't really do justice to the sweet packaging of these two products, especially their sepia-toned illustration of mid-nineteenth century dancers promenading in pairs along the length of a ballroom. The label of the perfume bottle is applied to the back of the bottle, so that the picture appears through the liquid of the fragrance itself, and the soap's wrapper is highlighted with fine, iridescent glitter. A historical note: when the waltz first gained popularity in genteel European society in late eighteenth and early nineteenth centuries, it was considered daring and even immoral. The coupled dancers held one another intimately in embrace-like poses, after all, rather than moving in line formations and merely touching hands. Newspaper editorials condemned the waltz's lascivious choreography, and none other than Lord Byron wrote a poem about the "voluptuous" new dance, noting its allowance of "hands promiscuously applied." However, there's nothing scandalous or voluptuous about Tokyo Milk's Waltz fragrance, which is accurately described by the company as a composition of "linden, honeyed rose, wisteria petals, white musk." The linden is most evident in a soapy top note that lifts to reveal a heart of dewy pink rosebuds, and the soft muskiness is suggested more by the earthy sweetness of the wisteria than by any deep or animalic base notes. It's a blushing, springtime nosegay of a fragrance, youthful and innocent, but just polished enough for post-teen women to enjoy. Waltz is unexpectedly enduring on my skin, especially for a delicate floral. It should appeal to admirers of L'Artisan Parfumeur's Drôle de Rose (because of its honeyed roses) or Bond no. 9's Eau de Noho (because of its linden note). The Waltz soap is a heavy, hefty bar, embossed with the letters of the alphabet, and it lathers and smooths the skin with shea butter and glycerin in a creamy, finely-milled base. Its Minuet 14 fragrance is labeled simply as "white linden," but that's a bit misleading, because the green linden note is deepened by something subtly smoky that could very well be vetiver. Minuet 14 presents an almost-masculine counterpart to the liquid Waltz, as if the soap were a well-groomed dancing partner who might offer flowers and compliments to the ingenue personality of the perfume. And, when left unwrapped in a soap dish, it scents the whole bathroom. Not daring, perhaps, but definitely charming. 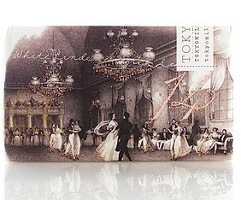 Tokyo Milk Waltz Parfum sells for $28 for 30 ml, and Waltz / Minuet 14 Perfumed Soap sells for $12 for an 8 oz bar. For buying information, see the listing for Tokyo Milk under Perfume Houses. J: Nice to see this! Tokyo Milk is one of my favorite lines. The bottles are cute and they don’t break the bank. I haven’t tried Waltz but you might also like Sparrow, gardenia and greens. It has amazing staying power too. Hi Suzanne! I was so pleasantly surprised by the quality of this scent in relation to the price! I’d love to try others from this line… thanks! They have a Lapsang Su Chong, but unfortunately it does not sound like it supposed to smell like Lapsang Su Chong. Have you tried the l’A Tea for Two for Lapsang Souchong? It seems like most tea scents involve green tea. Are there many with good black tea scents besides l’A Tea for Two for Lapsang Souchong? Bvlgari Black has lapsang souchong, doesn’t it? I thought I heard lapsang souchong described as having a rubbery, tar-riness to it. Black definitely has that kind of quality. I don’t get any rubber/tar from Tea for Two. On me it nearly verges on “too sweet” but I do like it a lot. Parfumerie Generale L’eau Rare Matale- I think this is supposed to be one of PG’s really good ones? I think it is supposed to be a refreshing black tea? I think Ava Luxe has a black tea scent. If you haven’t tried any of those, I’m sure they would probably be good to look into. &&& the perfumed court has TokyoMilk samples. Just thought I’d throw that out there. Oh, I see…I thought you were actually familiar w/lapsang souchong and were trying to match the feel you got from it. I’d say it’s more smoky than rubbery, although there is certainly an asphalt-like quality there as well. My husband loves it; I think it smells horrid. Cedarwood tea won’t work for you…that’s more of a light, meditative tea scent (I really like it, but definitely not anything like lapsang). Haven’t tried the others, though. Comme des Garcons Tea is the tea fragrance that comes closest to Lapsang of the ones I’ve tried, it’s smokey and not sweet at all. There’s a CB I Hate Perfume that I think might be pretty spot on too, Russian Caravan Tea. I’m not an expert on various types of tea, but L’Artisan Tea for Two is a great smoky tea with a drop of sweetness. Lovely for autumn! I’ve never had lapsang souchong, but I thought it had kind of a rubbery scent. Like the tea in Bvlgari Black. Tea for Two reminds me of a masala chai with sugar. I think I might need a full bottle, and I rarely think I need a full bottle of anything. Poe’s Tobacco says it has tobacco and tea, but it also says it has apple. I think samples of this line are hard to come by, and $28 is pretty cheap but I wouldn’t want to buy a bottle unsniffed. I have to save all my money for TH’s new single (probably imported from Germany), the album (probably imported from Germany), and concert tickets (which probably also means train tickets to NY). I can not afford frivolous items right now!!!!! Grandiflorum Tea Absolute is a favorite of mine! I’ve been so tempted to buy the unsniffed TM Lapsang Suchong because I love smell/flavor of the tea so much, and so does my husband, but I can’t get any info. My impression is that much of this line is very sweet. “Tea for Two” is nice but doesn’t quite do it for me. Tea scents are so very difficult to get right. Wonderful review…I love the historical tidbits and back stories I pick up here. I don’t often like rose scents, but I do love linden, and if the rose is mild rather than heavy, this could be a nice one. Unfortunately, my whole bathroom (and much of the rest of the house) is currently scented with the very heavy rose of the scented soap my 4 yr old insisted on purchasing for me for Mother’s Day. It was such a sweet gesture (she came up with the thought of buying me something all on her own), I couldn’t refuse her even though the smell is awful. That is just too adorable! A little tiny perfumista in training! I had one of those too…..now a 17 yr old perfumista in training…I’ll warn you Boo….by 17 their tastes can become verra verra expensive! Better watch your Amouage bottle carefully! I keep putting it back in the box to “save for special”… but she keeps pulling it back out to use herself. It is decorative…and very grandmotherly. But yes, she is adorable, and unfortunately it seems that expensive taste is in the genetic code… she already has it. Her first pick for me out of my samples was the POTL Luctor et Emergo. And she keeps stealing the body cream. Give her a choice of two similar scents, she’ll choose the more expensive one every single time. I just blame it on MIL; she’s a noblewoman. Funny — and …MIL IS a noblewoman, or just thinks she is? well there ya go….let the 4yr old take the soap in the shower or bath with her…it’ll get used up faster. But she sounds like she is really enjoying it and that’s really darling. Maybe next time you can pick the scented soaps for her to use….then it won’t over-fragrance the house. And a bent for quality never hurts, either. No, she actually is. But it passes down through the father, and FIL was from the States, so my husband escaped all that nonsense. His cousins were less fortunate. Daisy, I have the same problem! My daughter gave me Ralph Lauren’s Love fragrance in a body cream – the one with the 24-karat gold plated lid that weighs about a pound by itself! I don’t know what to do. I hate patchouli, and the cream has a deadly lasting power. But she was so sweet to give me such an extravagant gift. Wish it had been some other fragrance! You know, if we were to join forces, we could probably be an army of two. Just think of the deadly assault power of heavy patchouli paired with strong soapy rose! Walk into a room, everyone would lose consciousness…and we could make off with their valuables. Swapping is the perfect idea for situations like this, as long as the person won’t be checking your bathroom for the gift in question! that’s a tough one Monsta, how old is your daughter? If she’s old enough to understand and talk to about it then swapping could be the answer depending on how you handle it. If she’s really young then it’s hard because swapping could be taken as rejection…. She’s 23. I think she purchased the Love cream because of its name. Guess she must love me…and no, I can’t swap it, esp. after telling her how much I adored it. I figure I can throw out a giant scoop out of it just before her visits, so she thinks I’m using it like crazy, and one day – thank God – it’ll be empty. The jar is amazing, though, beautiful design. How can you throw out a lid coated in 24k gold? Maybe I can put something else in there…. I’ll have to look into this – I love linden and it is kind of hard to come across. I also adore fabulous soaps, although I tend to buy mine at Ross or Marshalls – the luxe soaps there are wonderful and cheap. But I will shell out now and again for something special. Tama, I just tried a fragrance, CLEAR by Neil Morris, that features linden blossom. You might take a look at his website to see if it’s one you might like to sample (if so, let me know – I can share mine!). Also, you may already have tried Ormonde Jayne FRANGIPANI ABSOLUTE. It lists linden blossom also. I SO wanted to love that fragrance, but alas it wasn’t for me. I’m a big fan of hefty and fragrant bars of soap, Jessica, and this one sounds great! Thanks for the review. Thanks, Tama and Haunami! I’m glad to report that this soap is still going strong, despite a few weeks of daily use! I haven’t tried any Neil Morris OR Ormonde Jayne (horrors). I’ll take a look at the website and let you know! Hi Tama, I think Jo Malone’s Lime Blossom is still available, and I think NST has done some linden / tilleul posts in the past… It’s such a fresh, clean note. Thanks for the review … I don’t own anything of this line, but a shop a block away from where I live carries it and I’ve tested many of the fragrances and given some of gifts. The packaging is just so good! My friend likes one of their other scents called “Let Them Eat Cake” and it does smell good on her. Jill, They do seem to have a few nice sweet blends! I’m curious about Le Petit Parfum and Honey & the Moon, too. One of my favorite honeys is actually a lotion – Kiss My Face Calendula and Honey. I also love Lush’s Flying Fox shower gel – don’t know if it is still around. Flying Fox does still exist, and better yet… B Never Too Busy To Be Beautiful shower gel is available for reasonable shipping rates, from http://www.bnevertoobusytobebeautiful. Gorgeous pure honey! Thanks so much for this review. I’ve never tried anything from this range was happy to know about a bit of it from you. Happy to help! I should have also noted that they are apparently available in some Anthropologie stores, so if you have one near you, you may be able to check them out in person. Very cool post Jessica! What is Linden? My LA La Chasse Extreme has Linden Blossom in it, I think.. This, sounds terribly romantic, of which I am a sap. I love the sound of Sparrow, Gardenia and Greens. Since I work with wildlife and feed many sparrows from many feeders. I even know their names! I have an onscreen name of Godsparrowlass on another site. Corny isn’t it? It’s a dating site. Yuk, I know. Anyways, (chatter, chatter, chatter), my new found love of a scent is Marc Jacob’s Gardenia Splash, light not heady, swoon worthy, do ya think I might like this? Has anyone else tried it ( The M.J.)? I don’t think anyone so far can do a better Gardenia than M.J. The scientific name for Linden or Lime is Tilia. Old Lime trees used to mark the centre of central European villages. There are different species in America than in Europe. The blossoms have a characteristic, very soft and ‘clean’ scent. I always have Linden blossom tea in the house. If not anywhere else you can always find it in Turkish shops. Amendment, Jessica, do you know of a light smelling Gardenia body lotion or cream, the would keep the Gardenia Splash going? I defer to your expertise. Anyone can chime in of course. I don’t, but what about an unscented cream? The oils in it would help to prolong the scent of the frag applied on top. Gardenia’s are interpreted so differently. If Marc Jacobs had a matching body lotion…The perfume is way different. I need a barely gardenia cream. I really don’t even know of a good unscented. Since most of my lotions are the “good for you” kind. Maybe Sephora’s Shea Butter. Hi Alotofscents, Jo Malone’s Vintage Gardenia is a beautiful gardenia scent, and JM sells a body lotion. Yves Rocher is more affordable and has many fans (although I haven’t tried their Pur Desir de Gardenia yet, myself). Thanks Jessica. I thought La Chasse had lime blossom in it too…but can’t remember. I’ll have to get a sample of the Waltz and the Sparrow. I went to their site and it sounds like a simple, unique, romantic line. I am trading a bottle of Yves Rocher Pivione for the Gardenia lotion. The Marc Jacobs splash is a dewy Gardenia, notes: dew note, nectarine, (which I can’t smell), gardenia, water Lily, airy note, and musks. It really does smell like gardenias floating on water. It is just plain hard to match. CORRECTION Not nectarine, Gardenia splash note’s: dew note, yuzu, clementine, water Lilly, gardenia, airy notes, musks. No wonder I can’t smell nectarines. I think this line has a limited scope (a few seem interchangeable), but it has flashes of eccentricity every now and then, plus it’s right for the price. And very cute packaging, for sure. I have Waltz, actually — a good spring date scent. They seem to focus on light florals, sweet gourmands, and citrusy woods, which is fine with me, since those are all types that I like! One of my friends has different tastes; she’s a fig-lover and she raves about Ex Libris. Ooh, I really like Ex Libris. A great little figgy-green; I only wish it lasted longer than 20 minutes on me. Thanks for this review. I’ve been curious about the line. I’m a sucker for cute packaging! The packaging really is adorable, and so many of the scents would work well for spring and summer. Thanks, Cynthia! I’ve never heard of Tokyo Milk until I read this. I didn’t know there were so many fans either? I checked out some of their perfume and they all look cute. Does anybody knows anything else about this company? Like their perfumer, or where the company is at? Hi Honeybee, I wish I knew more! Their website says, “New York / Denver,” but it’s just a home page with no additional information. I hope they’ll update / expand it soon. I haven’t been able to learn anything else through the internet. If anyone does know, please share! Gin and Rosewater sounds great for summer. I like your Waterhouse gravatar, by the way! I’m so happy someone reviewed a Tokyo Milk fragrance. I got “Honey and the Moon” some time ago from Anthropologie and it is my current favorite. There are a few others I want to try and am glad they are priced so I can buy a few! Hi, Odonata! I agree… as the prices for so many niche fragrance lines have been going up and up, it’s good to be able to purchase an affordable treat once in a while! This company just started making little solid pots of perfume. I haven’t smelled any of them yet and I wondered if anyone knew where to sample them. The packaging looks super cute though. Michelle, I haven’t even seen those yet! If do have a chance to try them, let us know what you think! I have just seen this line at my local David Jones in Adelaide. I was most delighted as not even Serge Lutens has made an appearance! I took a quick sniff from the bottles (as I had JPG Classique on my skin) of Song in D Minor and Honey and the Moon. I preferred Song in D Minor as the honey was quite strong in Honey and the Moon. I will pop back soon to try a spray on my skin. Lsnuing, So glad you had a chance to try these!